Quarter-finalists just over one year ago in Cartagena de Indias but no further progress, for the Argentine pairing of Gaston Alto and Horacio Cifuentes, at the same stage of proceedings in the Men’s Doubles event at the Sparta 2018 ITTF Pan American Championships in Santiago, Chile, life was different. There was further progress. On Saturday 24th November, they emerged the one surprise partnership to reserve a penultimate round place. The no.6 seeds, after accounting for Bolivia’s Franco Gareca and Eduardo Lizarazu, the no.15 seeds (11-8, 11-4, 5-11, 11-2), the duo ended the hopes of Kanak Jha and Victor Liu of the United States, the no.3 seeds (4-11, 11-9, 11-9, 12-10). A place on the podium guaranteed for 33 year old Gaston Alto and in harness with his latest partner, Horacio Cifuentes, a player from a totally different generation; he is just 20 years of age. Previously, in 2011 Gaston Alto partnered Liu Song to gold in the Men’s Doubles event at the Latin American Championships in Mexico, as he did later alongside erstwhile colleague Pablo Tabachnik in 2014 in the Dominican Republic and in 2016 in Puerto Rico. 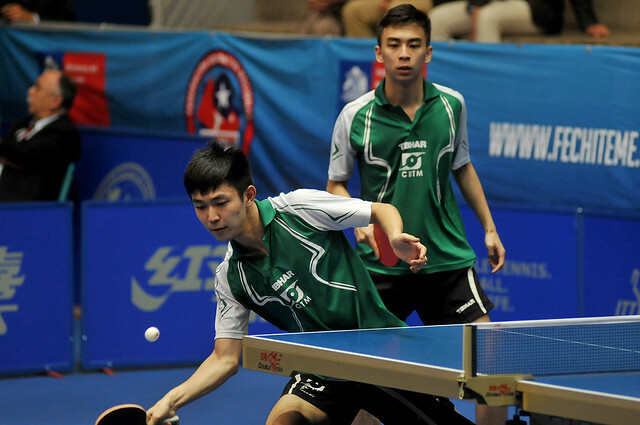 Additionally, on the GAC Group 2015 ITTF World Tour, Gaston Alto and Pablo Tabachnik, won on home soil in Buenos Aires. Equally, partnering Horacio Cifuentes, Gaston Alto has enjoyed success; additional to last year’s quarter-final appearance in Cartagena de Indias, they were semi-finalists in Santiago at the ITTF Challenge Chile Open. Notably the one difference in the latest partnership is that Gaston Alto is partnering a fellow right hander; both Liu Song and Pablo Tabachnik are left handers. Gaston Alto is ye good and honest performer, total commitment but I wonder does he realise he is so versatile! A somewhat surprise quarter-final success for the Argentine duo; in the remaining three round of last eight clashes, it was as status predicted. Brazil’s Vitor Ishiy and Eric Jouti, the top seeds and defending champions, the one pair who started their quest in the quarter-final round, accounted for Ecuador’s Alberto Miño and Emiliano Riofrio, the no.8 seeds (11-8, 11-9, 11-2). Meanwhile, after overcoming Guatemala’s Hector Gatica and Heber Moscoso, the no.11 seeds (8-11, 11-5, 11-8, 11-9), Paraguay’s Marcelo Aguirre and Alejandro Toranzos, the no.2 seeds, ended the aspirations of the host nation. They accounted for Gustavo Gomez and Juan Lamadrid, the no.5 seeds (8-11, 12-10, 13-15, 13-11, 11-3) to reserve their last four place. Hard earned success for Marcelo Aguirre and Alejandro Toranzos; for Puerto Rico’s Brian Afanador and Daniel Gonzalez, life was less fraught. They overcame Uruguay’s Pablo Palou and Facundo Rodriguez, the no.14 seeds, in three straight games (11-6, 11-4, 11-4), prior to ending the hopes of Mexico’s Marcos Madrid and Villa, the no.7 seeds, in four games (8-11, 11-7, 11-9, 11-6). At the semi-final stage Vitor Ishiy and Eric Jouti meets Gaston Alton and Horacio Cifuentes, Marcelo Aguirre and Alejandro Toranzos face Brian Afanador and Daniel Gonzalez. The semi-final and final will be played on Sunday 25th November.